We encourage you to use these questions with community, family, and friends to help you think through this week’s sermon. 1. Review the verses from the 9 Week Challenge together. 2. Todd made the point that we are “aliens and strangers in this world” (See 1 Peter 2:11). In what sense are we “aliens and strangers”? What in your life stands out to those who do not share your faith? What in your life compromises your testimony and undermines your ability to live as an alien and stranger in this world? 3.John 16:33 reads: “These things I have spoken to you, so that in Me you may have peace. In the world you have tribulation, but take courage; I have overcome the world.” In what sense has Jesus “overcome the world”? How can we experience peace in the midst of our trials and troubles? 4. 2 Corinthians 4:16-18 says: “Therefore we do not lose heart, but though our outer man is decaying, yet our inner man is being renewed day by day. For momentary, light affliction is producing for us an eternal weight of glory far beyond all comparison, while we look not at the things which are seen, but at the things which are not seen; for the things which are seen are temporal, but the things which are not seen are eternal.” On what basis can Paul argue that our trials are light and momentary? According to this passage, where does our hope lie? Upon what should we place our focus? How can your group encourage you to remain faithful during your time of trial? 5. 2 Timothy 2:3-4 reads: “Suffer hardship with me, as a good soldier of Christ Jesus. No soldier in active service entangles himself in the affairs of everyday life, so that he may please the one who enlisted him as a soldier.” Todd made the point that this is not our home and that we are at war. According to Paul, how then are we to live as soldiers? What do you think it means to live as a “good soldier” and “please the one who enlisted you”? What was one truth you walked away with from this week’s message? Leave a comment below and tell us about it! 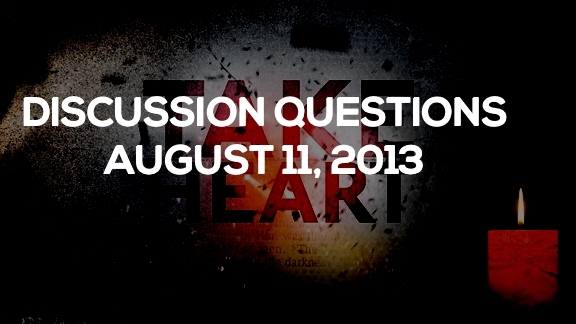 The post Discusion Questions: August 11, 2013 appeared first on Watermark Community Church Blog.